I’ve had the pleasure of meeting four newborns in the last two weeks – crazy baby boom! – and car seats and their quirks have come up in conversation. 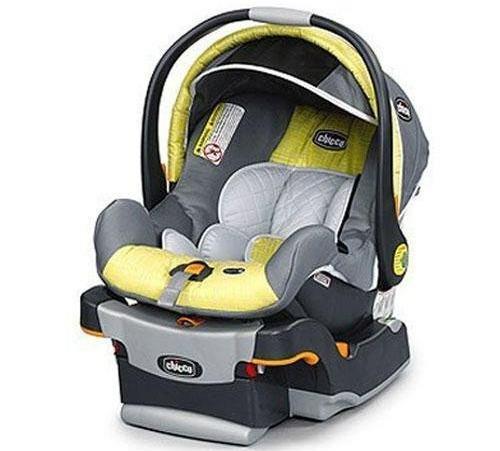 Most of the pre-baby focus on car seats is on picking a safe one that you can carry fairly easily and then going through the often very irritating process of getting it installed correctly. Those are the top priorities, but there’s more to know. Since I make a point of never reading instructions unless I completely, totally, 100% have to (R. loves this about me, I can tell – who wouldn’t enjoy all that swearing and throwing of allen wrenches coming from the other room? ), I did pretty much nothing with our Chicco KeyFit except pick it out. You can save yourself some hiccups later by not following in my footsteps and spending a few minutes getting to know yours a little bit better before the baby arrives. Light a couple candles, buy it a drink and have a chat. The shoulder straps’ are adjustable in two ways. First, and you probably know this already, you can tighten them – and you should: loose straps = not safe baby. Don’t plan on cinching Junior down uncomfortably, but he should be pretty well held in there, with the chest clip right over his chest. 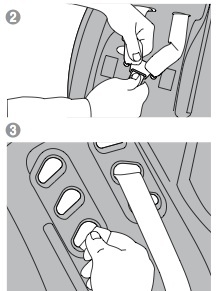 Try making the tighten/loosen adjustment a couple of times before your baby is actually in the seat so you know where to push and pull: trust me, figuring out car seat mechanics with a newborn all up in your grill is stressful. Second – you can also adjust the shoulder straps’ height to fit the height of your baby. It’s not readily obvious on many seats that you can do this, so a lot of first-time parents I know (including myself) don’t realize this right away. If he’s a tall baby and the straps come out way below his shoulder blades, or he’s tiny and they’re way above, you’ll want to move the straps into a different notch on the back of the seat. This is primarily for safety but also comfort. On Britax and Chicco seats, the adjustment is on the outside back of the seat. Check your manual for the instructions for your model. You can remove the car seat’s extra padding to make more room for little Florette’s shoulders. I had no idea on this one either. Astrid was really tall and after not that many months, I thought we were going to have to bump up to a toddler seat because she was all squashed in her infant seat. Silly me. Those comfy pads surrounding the hips and shoulders of teeny tiny, can’t-sit-up, oh-so-fragile infants are just held in by Velcro and can be safely taken out to make room for a growing baby (or a very healthy giant newborn). This is also good to know if there is some sort of diaper/bottle accident in the car seat: most are also machine washable (on cold, in gentle detergent + air dry). Usual caveat: I don’t know specifically which car seat you have, so please don’t get out your Xacto knife and have at your cushioning. If it comes out, it’ll come out easily. Check your manual, etc. 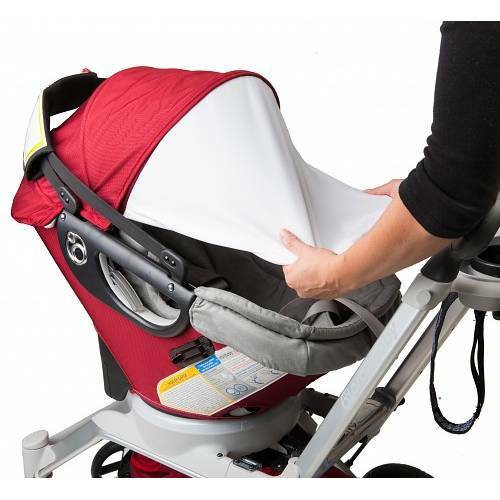 And finally, have a look under the hood, especially if you have a Chicco KeyFit: there’s an additional six inches of sunshade folded back under your car seat’s extendible canopy and you’ll want to use it. Carrying Astrid around one day, I looked enviously at a mama with an Orbit car seat that had a full sunshade extension that covered the baby completely so she could sleep out in the sunshine. Orbit calls it a “Paparazzi Shield” which, you know, I definitely need, what with being so famous and all. It’s a burden. Sarcasm aside, being able to shield Baby from rays and rain is necessary – and useful when she’s napping – so check out what comes with yours: you might have some extra shade hidden under your canopy too. I didn’t discover ours until months after A. was born. That whole not-reading-the-manual thing is clearly working out really well for me.